Construction of the Poowong, Loch and Nyora Sewerage Scheme continues to progress well. 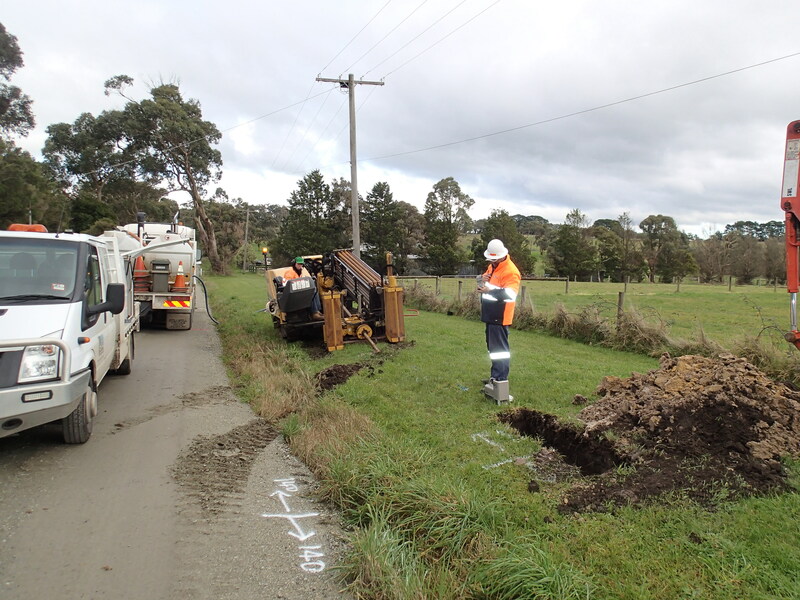 The Connections Team have commenced on site consultations with homeowners in Nyora to identify the location of on property pressure sewer infrastructure. All Nyora properties in the Mandatory Area and any in the Voluntary Area wishing to connect to the sewer will need to arrange an on-site visit with the Connections Team. Simply call 1800 728 256 to book an appointment time. On-site consultations for Poowong and Loch will commence in the New Year. Construction of the transfer main connecting Nyora to the Lang Lang Water Recycling Plant continues with approximately 6 kilometres of pipework installed. In addition, construction of the transfer main connecting Nyora and Poowong has now commenced. Pressure testing of the Poowong reticulation pipework will be completed shortly and now only small sections of township reticulation remain to be completed, for rail and highway crossings at Nyora and Loch. For any general queries regarding the Poowong, Loch and Nyora Sewerage Scheme, please call South Gippsland Water on 1300 851 636.